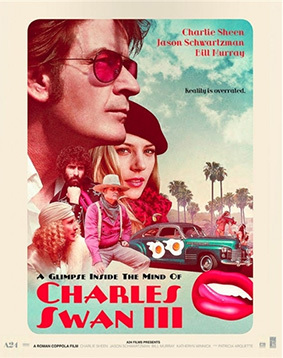 Set in Seventies glossy Los Angeles, A Glimpse Inside the Mind of Charles Wann III is a playful comedy of lost love, relationships, revenge fantasies, and Brandy Alexanders. Charles (Charlie Sheen) is a successful graphic designer whose fame, money and charm have provided him with a seemingly perfect life. But when Ivana (Katheryn Winnick) - the woman of his dreams - leaves him, Charles falls apart and swirls into fantasy-inspired reflections on his colourful past and the women who played a part in it. Can his best friend Kirby (Jason Schwartzman), advisor Saul (Bill Murray) and sister Izzy (Patricia Arquette) help Charles come to terms with life without Ivana? Written and directed by Roman Coppola (Moonrise Kingdom, The Darjeeling Limited), A Glimpse Inside the Mind of Charles Wann III is an eccentric, surreal comedy with larger than life characters, wrapped up in the colourful pop-art world of Seventies Los Angeles. You can read our own Timothy E. RAW's review of the film here. A Glimpse Inside the Mind of Charles Wann III will be released on UK DVD on 30th September by Koch Media. Some extra features would be great, but it doesn't look as if we're going to get any.